I grew up hiking, backpacking, and skiing in the Northeast including New York, New Hampshire and Maine. I have been hiking for about 18 years and have been backpacking for about 10 years. I have lived at the Grand Canyon and I now live in Yellowstone. In these experiences, I have slept on a tarp and in a tent, worn hightop boots and lightweight shoes, carried an external-frame pack and an ultralight internal-frame pack. Most of my hikes are 8 to 15 miles (12-24 km). I'm not fanatical about light weight gear, but I am starting to be mindful. The main shaft of the filter is translucent grey plastic through which the user can see the ceramic element, which I will discuss in a later paragraph. At the bottom of the filter, there is a cap that screws on to the part where the clean water is expelled. 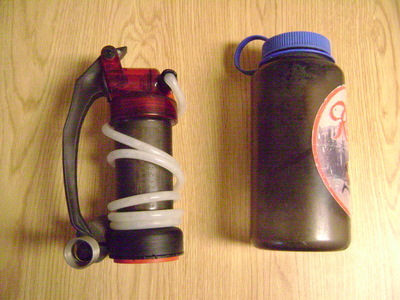 The threads of the screws of the filter are made to fit onto a Nalgene. On the screw cap is a piece of red plastic that is in a crescent shape which is used for measuring the wear on the ceramic element. Moving up the filter is the red translucent plastic piece into which water is initially pumped before it is pushed through the ceramic element and filtered. There is a chamber that is cylindrical and about an inch and half (3.75 cm) by an inch (2.5 cm) in this section. In this chamber is a round piece with a rubber seal which moves in the chamber and is controlled by the pump handle. The pump handle is a black plastic piece and is almost as long as the filer itself. At the end of the handle is a hook for securing the hose while the filter is stored. The hose runs from the red plastic piece of the filter. It is about 48 inches (122 cm) long. Towards the end of the hose is a grey rubber piece of foam which serves as a float. At the end of the hose is a metal coil that serves to protect the intake valve. The intake valve is a black plastic piece connected to the hose. It has three openings. One is where it connects to the hose and the other two are on the sides where it draws water into the hose. Through the two holes is a piece of a grey porous sponge meant for filtering out large debris. The user can screw off the red plastic piece from the main shaft. After doing so, the ceramic element can be popped out of the grey plastic shaft. The element is pale orange in color. On the current models, the elements are ceramic, but they used to be carbon. The element can be touched, but is very delicate. It is the main filtering piece of the unit. It can be cleaned in the field and eventually replaced. Both of its ends are hard plastic. One end has a rubber O-ring and spout which is where the filtered water comes out. The other end has three points that allow three spaces for water to go into the element from the cylindrical chamber. Once the water is pumped into the main chamber, it is filtered by the exterior of the element and eventually comes out through the spout at the bottom. The crescent shaped plastic piece discussed above can be put around the ceramic element to measure how much the element has worn. If the crescent shape piece can slide easily on the shaft, the shaft should be replaced. All of the dimensions, both weight, height, and width are true to the listed dimensions. With the carrying case and scrubbing pad, the filter weighs 17 oz (482 g). 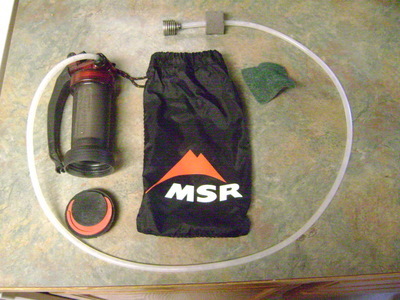 I have owned my MSR MiniWorks EX water filter for about two years. I first bought it when I moved to the Grand Canyon in the summer of 2008. The first time I used the filter, I was pumping water that came from a seep spring on the east side of Horseshoe Mesa off the Grandview trail called the Miner's Spring. 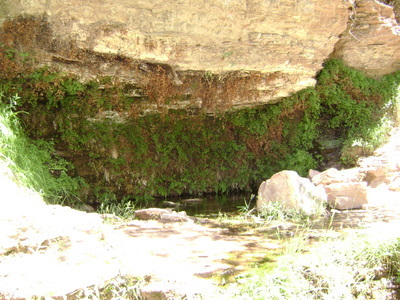 The spring collected in a pool after it had made its way through a couple thousand feet of sandstone. If I filled my bottle right from the seep, I would not have needed to filter it at all. However, I was excited to use my new filter and because I took the water from the pool rather than the seep, I probably needed to use it. The main point I am making is that the water was very clear and probably clean. Even though this was the first time I used the filter, I would not describe the flow as "fast". It was not slow either, but rather steady. MSR claims that the filter pumps 1 liter per minute, and from the start, I found that this was not true. With this first use, I would say the flow was closer to 1 liter per 90 seconds. MSR says it takes about 70-80 pumps per liter, and although I was not counting, I would say this is fairly accurate. Despite the fact that the filter was a little slower than advertised, it still pumped water at a fine rate, and the water tasted great. I continued to use the filter over the next couple months about one to two times a month for a one to two days each time. 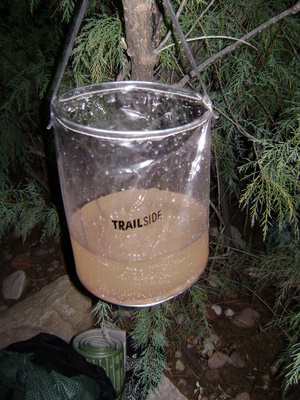 I was hiking in the Grand Canyon, so whenever I was using it, I was pumping a lot of water per day. Usually, I was carrying about 4 liters per day. At the beginning of August, I did a trip down the Tanner trail with a friend, and the Colorado River was our main water source. Two days previous, the Grand Canyon received its largest monsoon storm of the season which lasted about an hour. For those people that are not aware of Arizona's monsoon season, it is no joke. It receives heavy (and I mean heavy) rainstorms that come from India during the summer months, which cause frequent flash floods. What this meant for our trip was that the Colorado River was filled with an extremely high level of silt and debris that was washed into it by the heavy rainstorm and was very muddy brown in color. I was prepared for it and brought a bucket to fill with water so the silt could settle to the bottom before I would attempt to filter it. I knew that if I tried to dip my filter straight into the river, I would have no chance at successfully filtering the necessary amount of water without clogging my filter. After allowing the water to settle for two to three hours, I tried to filter some. Within a liter, I could feel that pumping had become much harder and that the filter's flow had dropped considerably. After filling my first liter, I popped the ceramic element out of the main shaft to look at it. It was noticeably covered with a layer of fine brown silt. Although the filter can be field cleaned, it is not always a convenient process. The MiniWorks comes with a green scrub pad which is meant for cleaning it. However, to use it properly, the filter must be cleaned with pure, filtered, water while it is being scrubbed. Considering how silty the Colorado River was that day, I did not have a lot of confidence that I would be able to clean the filter to the point where it would continue to be useful. In short, the clean water I had already pumped was too valuable to waste on cleaning the filter which would become clogged as soon as I started filtering again. I lamely tried to clean the filter, but I did not get another full liter out of it. My friend had another brand of filter which was able to get us through the weekend. However, our routine for the weekend consisted of filling the bucket with water, waiting four hours, covering the intake valve with a bandanna, filtering about two to three liters before starting over again, and remaining very dehydrated. Although the Miniworks failed on this trip, I do not place a lot of fault on the filter as the conditions were extreme. When I got home, I thoroughly cleaned it where good water was plentiful. MSR recommends boiling the element to fully sterilize it. Also, after boiling it or using it for any extended period, MSR recommends letting the filter dry for a full three to five days. I have not always been disciplined about doing this, but I have been better in the past year than I was in the first. Since my experience on the Colorado River, I have continued to use the Miniworks and have good experiences with it. Most of the other times I have used the filter have been on clear streams that do not carry much silt. For the most part it has continued to operate on the same level that it did when I first used it at the seep spring meaning about 90 seconds per liter. In one instance, it plugged up on a reasonably clear stream, but in this case I was able to clean it in the field and continue using it throughout the trip. On another hike, I returned to the Colorado River. I still used a bucket to let the water settle, but it was not nearly as silty, and the filter held up reasonably well. Its flow was definitely slower, but I was able to spend four days on the river without any issues. In my experience, the pump handle for the Miniworks is overall very comfortable and ergonomic. The handle moves towards and away from the main shaft horizontally. It is a mostly natural movement that has allowed me to pump up to four liters at a time comfortably. Usually, I will hold my Nalgene in between my knees, while I hold the shaft with one hand and pump with the other. Also, the pump handle has held up well in addition to the rest of the mechanical parts of the filter. Nothing has broken. MSR sells replacement elements for the MiniWorks, and although I probably should buy a new one, I have yet to do so. I still have the original ceramic element that is about two years old now. One of the other things that I have enjoyed about the MiniWorks is the ease of troubleshooting. There are a couple ways of examining the filter while in use to determine why it might not be working optimally. The main way of telling is the cylindrical chamber into which water is initially pumped. When the filter is operating properly, this chamber should fill almost completely just leaving a small air bubble at the top. If it is not filling properly, either the intake hose is not fully submerged, or the filter is clogging. Another way of detecting if the filter is clogging is through the pump handle. If pumping becomes noticeably harder, the filter may be clogging. On the other side, if the pump is snapping back to the body of the filter without any force, the intake hose may be twisted and airflow cut off. Another nice feature of the filter is the translucent shaft. Through this plastic, the user can detect the height of the water level. If the water level is staying high without dropping, the pump may be clogging from the element. Although I have had a number of experiences with the Miniworks clogging while in the backcountry, I very much enjoy that I have always been able to detect the problem and that the problems have always been simple and fixable ones. If slow and steady wins the race, the MSR MiniWorks EX is a great filter. I have used other filters that have pumped faster, but the MSR MiniWorks has many other features that make it very user friendly. Unlike other filters that I have owned, no piece of it has yet to break. All of its valves and plastic extremities have proven to be very durable. Also, it is field cleanable, which I like a lot. It needs water to be cleaned, so the one time I found myself in a situation in which I knew resistance was going to be futile, this was not particularly helpful. However, as stated above, this was an extreme situation. Not only is it field cleanable, but it is easy to figure out what the exact problem is. All the problems that I have experienced with the filter have been relatively simple to determine and fix. I have used other filters in which I have had to spend hours trying to figure out what was causing any particular problem, which I found extremely frustrating. All the water I have ever drank from the filter has tasted great. I have owned the filter for two years and filtered many many liters with it. It has continued to work well. It definitely requires proper care, which I have recently started giving it, but for someone who is willing to put in the effort and is slightly mechanically inclined, I recommend it highly. This report was created with the BackpackGearTest.org Report Writer Version 1. Copyright 2010. All rights reserved.